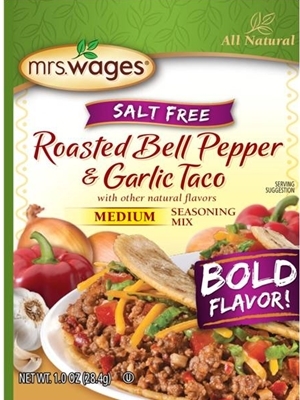 Mrs. Wages Roasted Bell Pepper & Garlic Taco mix offers a bold flavor with a medium heat level and is SALT FREE! DEHYDRATED VEGETABLES (GARLIC, ONION, RED BELL PEPPER, CHILI PEPPER), CORN STARCH, SPICE, YEAST EXTRACT, NATURAL FLAVOR (INCLUDES GRILL). SOYBEAN OIL, CITRIC ACID, MALTODEXTRIN, INACTIVE YEAST, GARLIC EXTRACT, LESS THAN 2% SILICON DIOXIDE (ANTICAKING).